My old entryway, left of the Dining Hall, in the South Court of Berkeley College. I lived on the top floor for two years. Say Rich Lowry. Unfortunately, he does not mean we’re living in linenfold panelled rooms inside granite and sandstone Gothic and Tudor architecture furnished luxuriously in oak and leather, where they cook our meals for us, and wash our dishes, and a janitor arrives every morning at our door to empty our wastebasket. No, what he means is we’re all living in an environment filled with ideologically-deranged fanatics whose heads are full of irrational grievances and unappeasable ethnic and class-based animosities who are ready to form lynch mobs or create star chamber proceedings to punish the sane and normal for deviation from the religion of Intersectionality at the drop of a hat. Brett Kavanaugh was a very good boy, with better report card ratings in Deportment than you or me, and that has not saved him. If they can take out Brett, they can get to anybody. 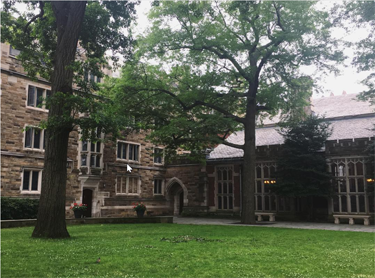 3 Feedbacks on "“We all Live in a Yale Residential College Now”"
I think that’s exactly the message they would like everyone to hear. In everything they do, the Left demands the subjective trump the objective. They demand their passion given greater weight than facts. They are at war with the Enlightenment, which gave reason to the modern world. They want a medieval world where tribes war against each other for irrational reasons.